The Alter G Anti-Gravity Treadmill is a new technology in physical therapy that reduces the amount of gravitational pull on your lower extremities while walking or running. Now our patients--especially athletes--can continue a regular exercise regimen while preventing or recovering from an injury. This is done by unweighting the patient once they're on the treadmill by anywhere from 20% up to 100% of their body weight. The result is exercise with less muscle pain and joint stress. SROSM has an Alter G machine at each of its facilities in the North Houston region. For patients who are in the process of recovering from an injury, the physical therapy team will work with our sports medicine physicians to review each patient's goals and determine the best plan for unweighting while exercising. 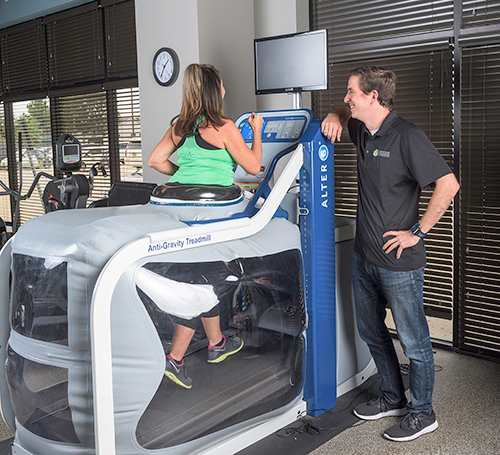 If you’re interested in using the Alter G as part of your physical training and to help you avoid injury, you can schedule sessions at either our location in The Woodlands or Spring. No physician office visit co-pay is required as part of this program. It's more like a gym membership! Simply schedule when it’s most convenient for you and experience training with less gravitational pull!